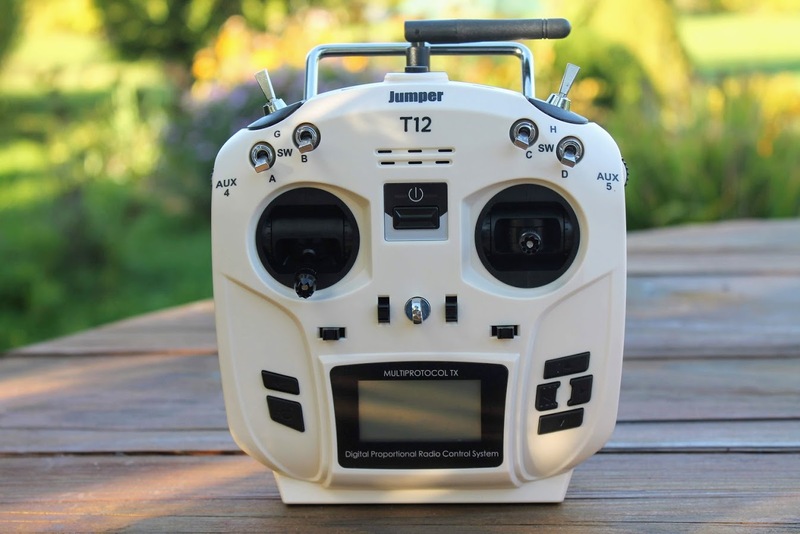 Jumper has released new model of their T8SG radios – Jumper T12. 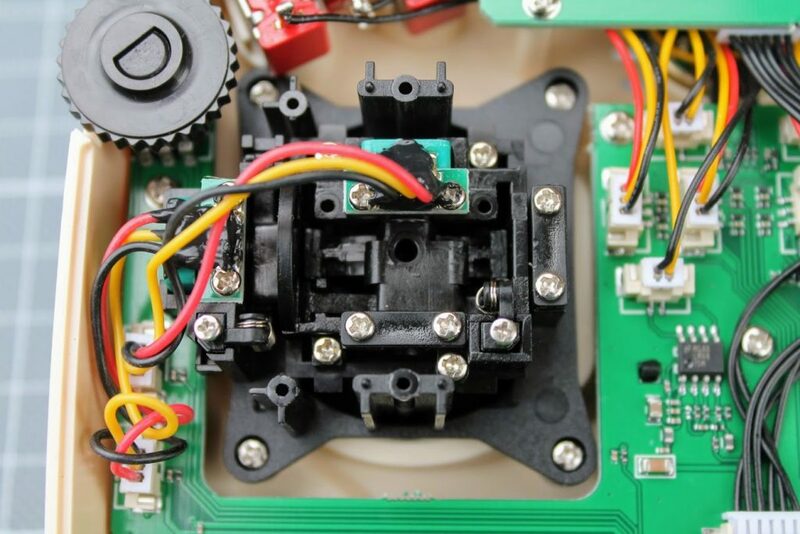 Lets take a closer look at this transmitter. 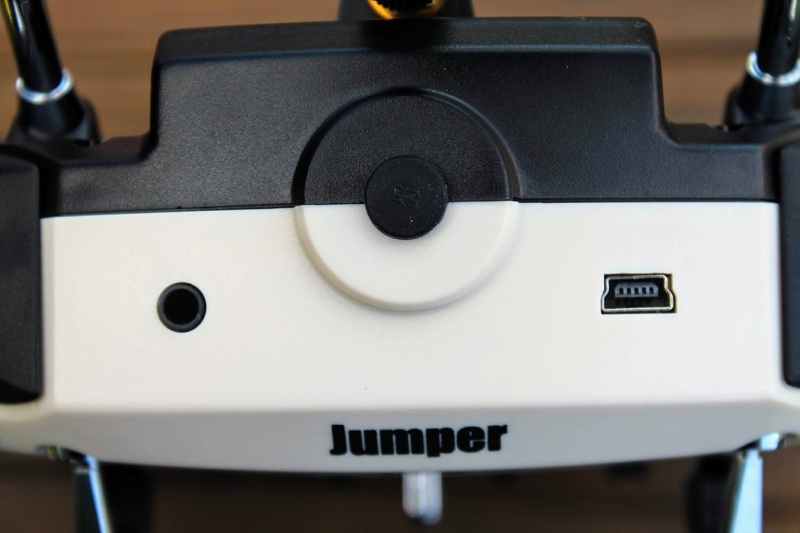 Jumper is relatively young company, manufacturing RC products and mainly got well known when they have released their first radio control transmitter. They have introduced their first Jumper radio transmitter, called T8SG, in August, 2017. 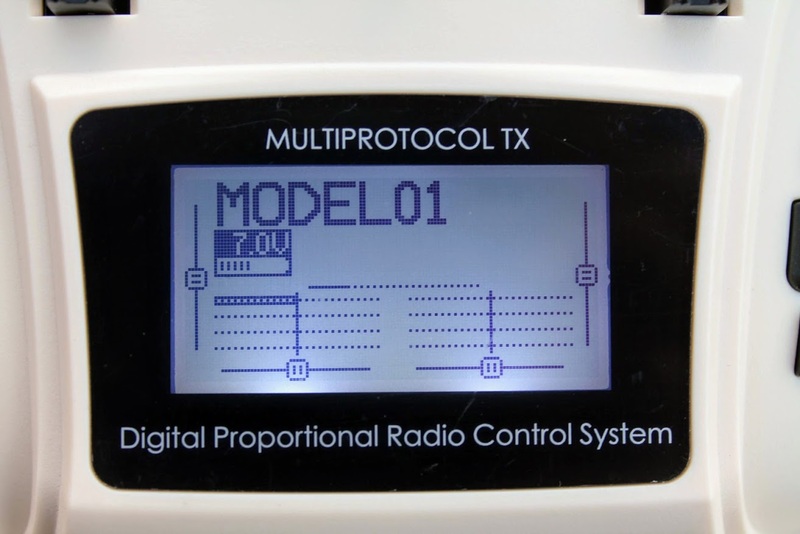 This radio was the first “all” protocols capable radio on the market with the built in multiprotocol TX module. 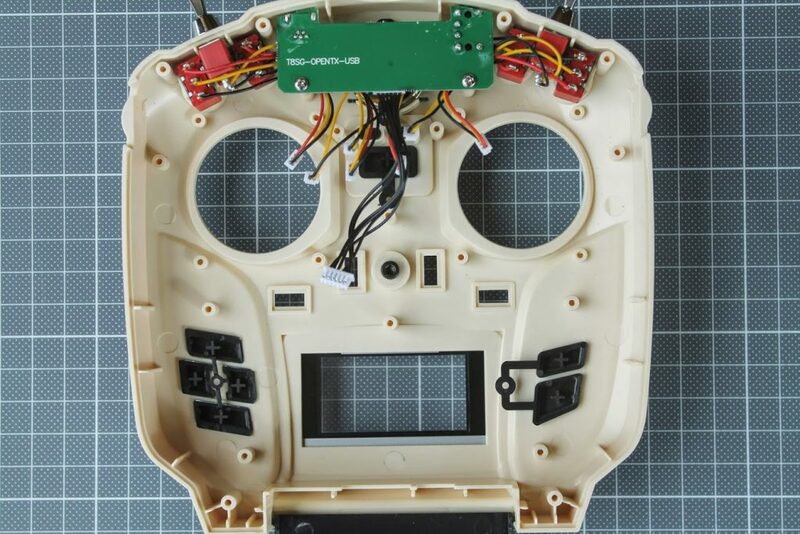 This module had 4 RF chips – FrSky (CCc2500), Flysky (A7105), Spectrum/DSM(CYRF6936) and Bayang/most of toy aircrafts (NRF2401). 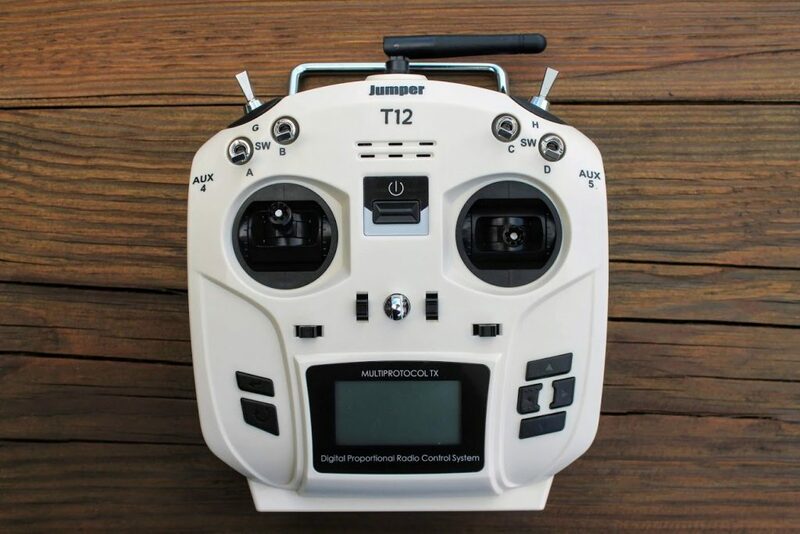 Jumper T8SG had the Open Source Deviation firmware installed. 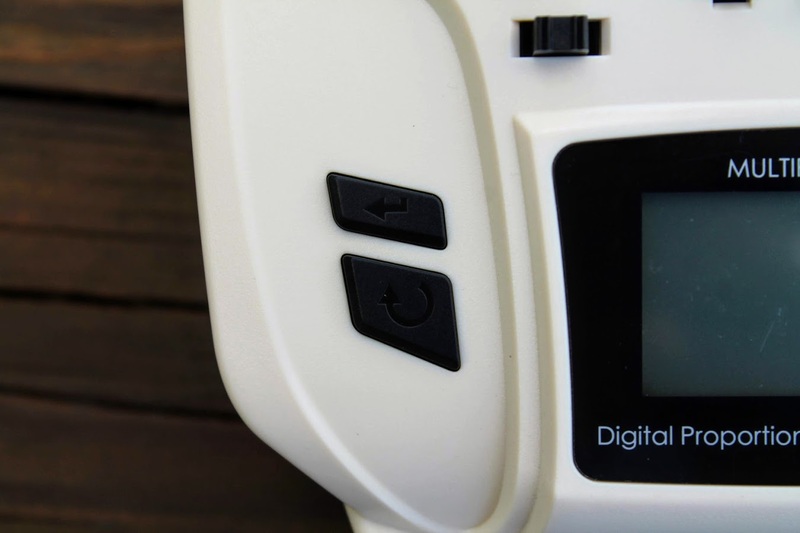 These features were welcomed by customers and Jumper radios got popular very quickly. 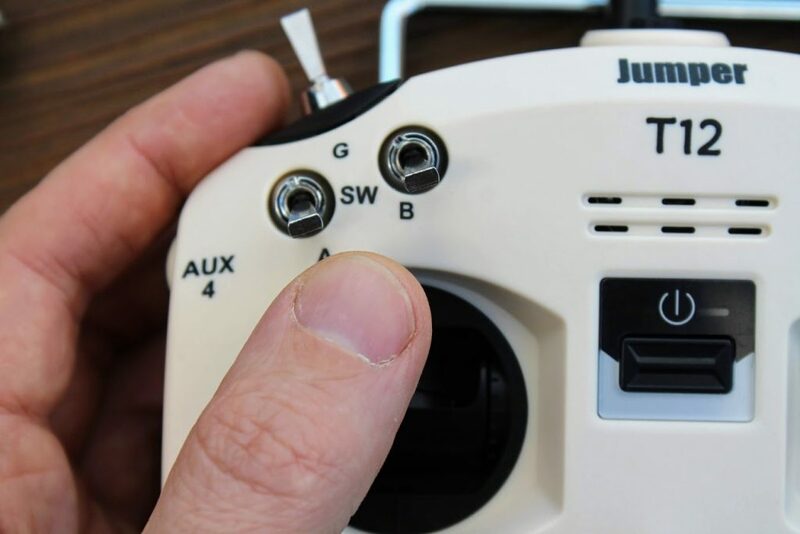 However the first generation of Jumper T8SG radio had issues with gimbals, small LCD screen, USB port beeing burried inside the transmitter, ergonomics and other issues. 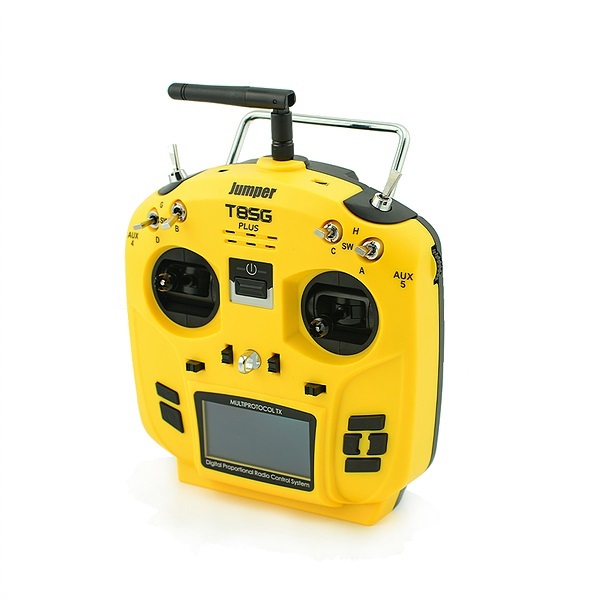 So in the January 2018 Jumper has released new transmitters – Jumper T8SG V2 with upgraded gimbals, LCD screen, side scroll wheels and Jumper T8SG V2 Plus with hall gimbals, OLED screen and side scroll wheels. In the July 2018 Jumper introduced the T12 – first Jumper radio with OpenTX. 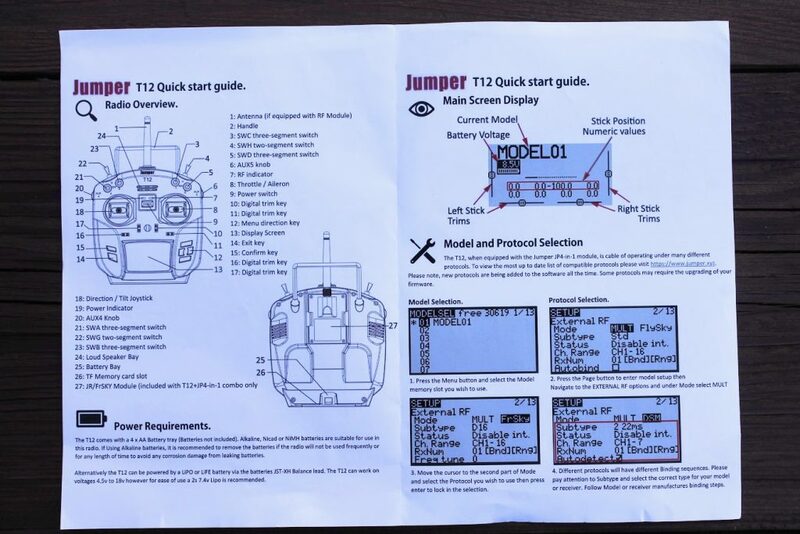 So much of the history, let’s jump to the Jumper T12. 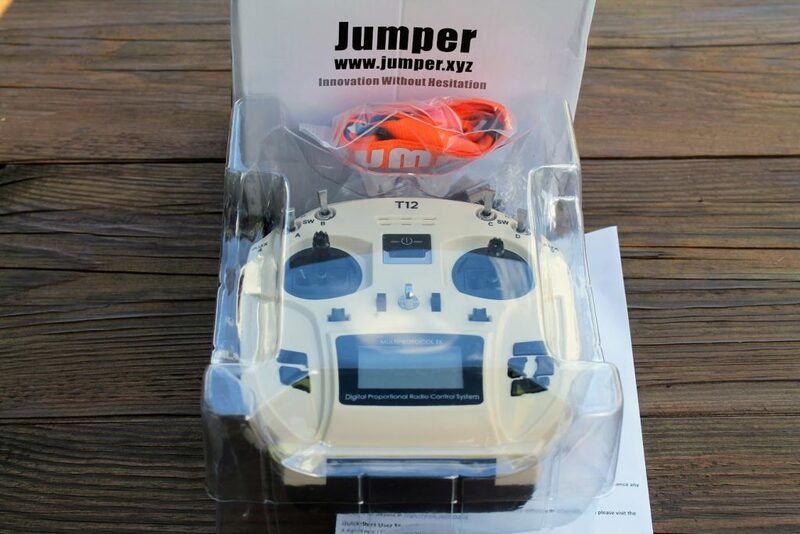 Jumper T12 comes in the simple plastic-carton box packaging. Includes Transmitter, USB cable, lanyard, and quick start guide. 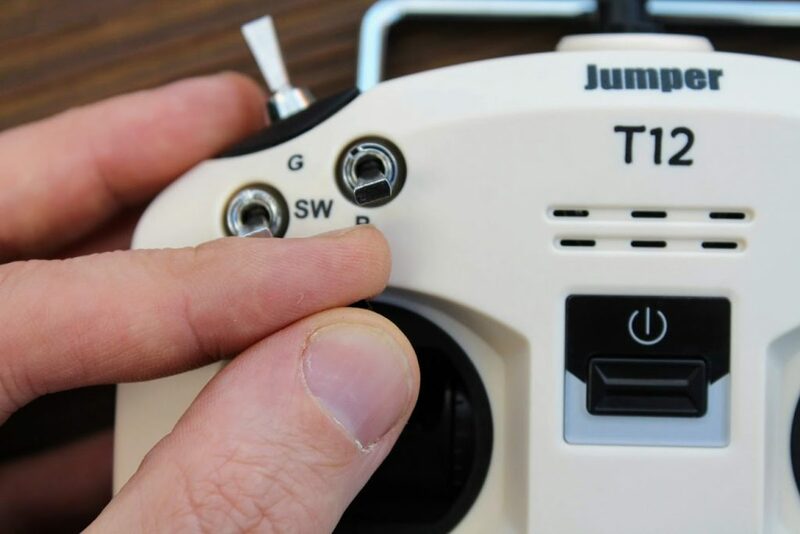 Jumper T12 has two 3-pos, one 2-pos switches ant a pot on the the top side. Above the power button there are two multicolored leds, changing the color by the status of the radio. There are two buttons on the left side. The configuration of them is the weirdest thing – the upper, smaller button is for [Enter] function and the lower is for [Cancel] function. Soon I found out that my brain wants to press the buttons in completely the opposite way – lower, bigger one has to be the [Enter] button. Two weeks of the transmitter usage did not help and I still keep forgetting and mixing these keys. 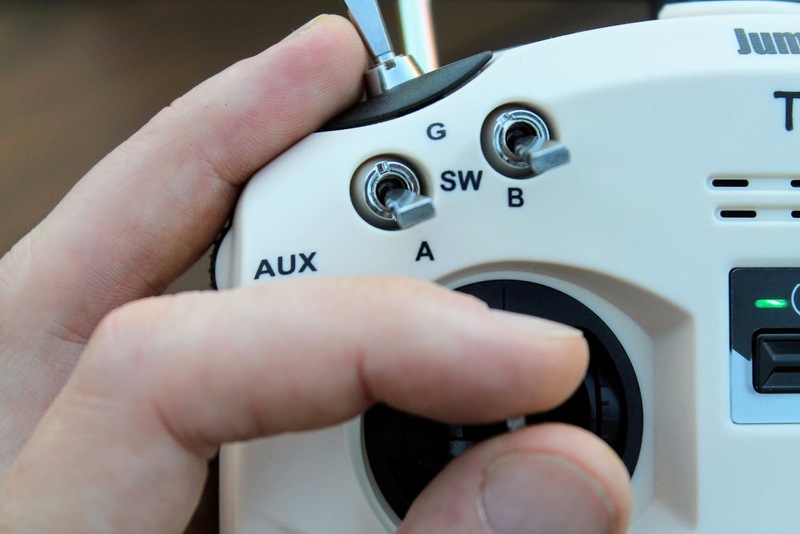 On the right side of the transmitter you will find the navigation buttons. 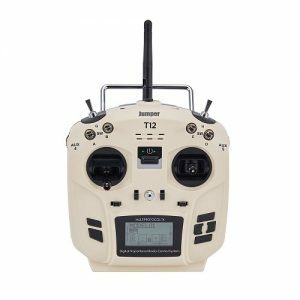 I have to say, that navigating the OpenTX (or JumperTX) is not so intuitively easy as using the rotation encoder in the FrSky Taranis Q X7. 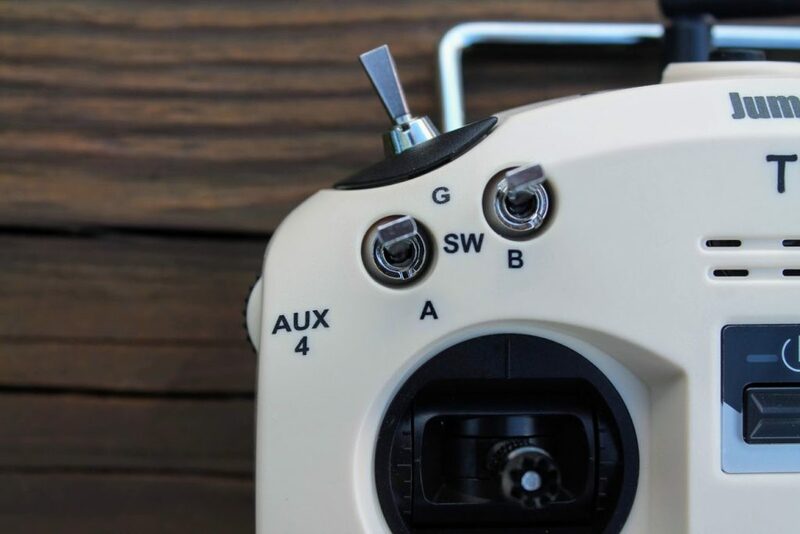 The gap between the lower position of the 3-way switch and the topmost right position of the gimbal stick is only 9 mm. 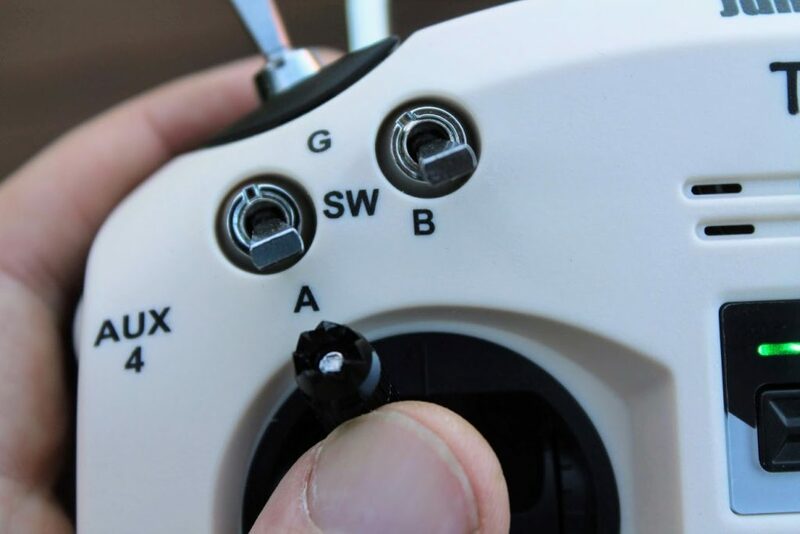 This can be the problem for pinchers – you can accidently push the switch up while moving the stick. While the thumbers should be quite comfortable. 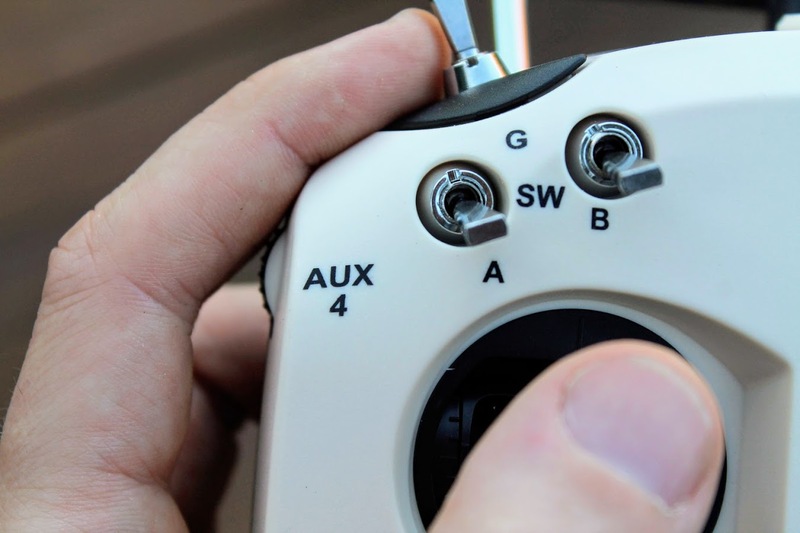 Side rotating dials are not positioned conveniently it would be better to have them on the top side of the transmitter, where the finger rests. 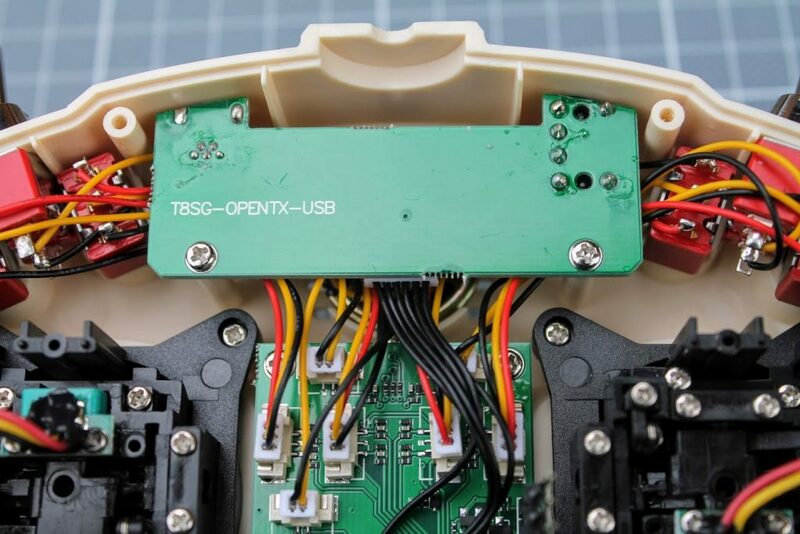 On the top side there are 3.5mm PPM/Trainer port and Mini USB socket for connecting the radio transmitter to the PC. 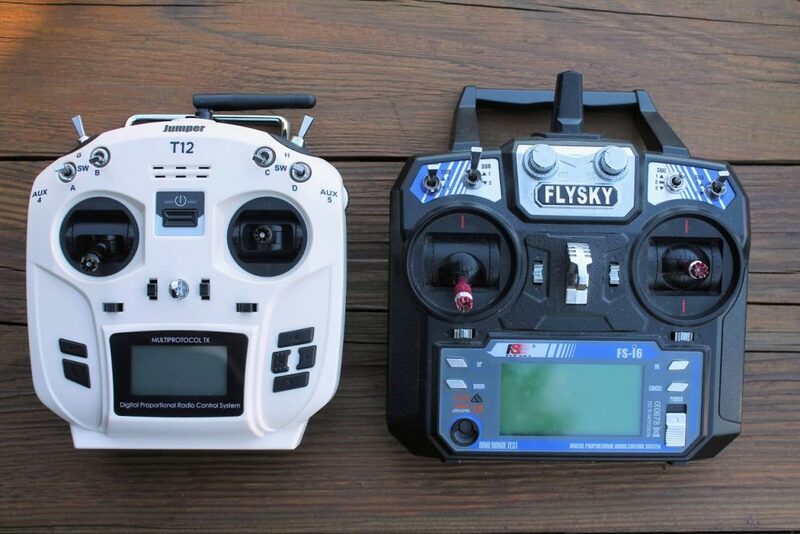 Size comparison with the Flysky FS-i6 transmitter. About the same size, but Jumper T12 is narrower and the the gimbals are close to one another and are slightly mover up in comparison with the FS-i6. 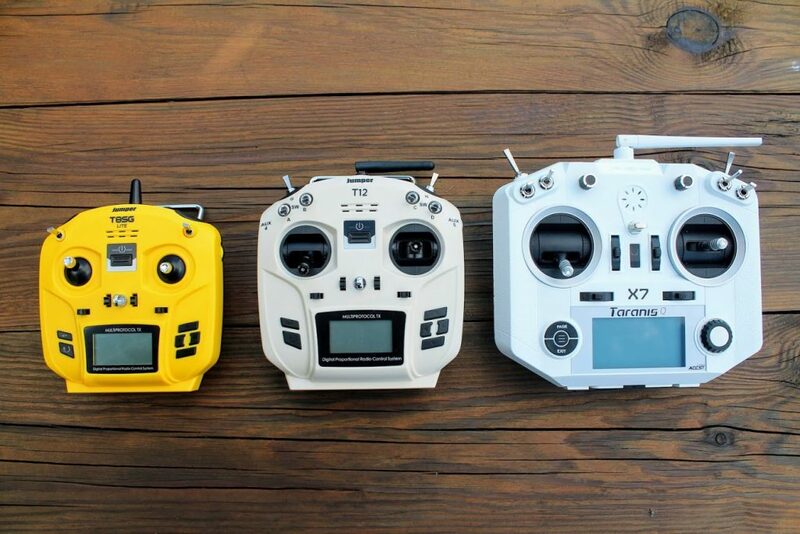 Size comparison: Jumper T8SG Lite, Jumper T12, Taranis Q X7. On the back side you’ll notice the grips that are very similar as seen on Taranis. 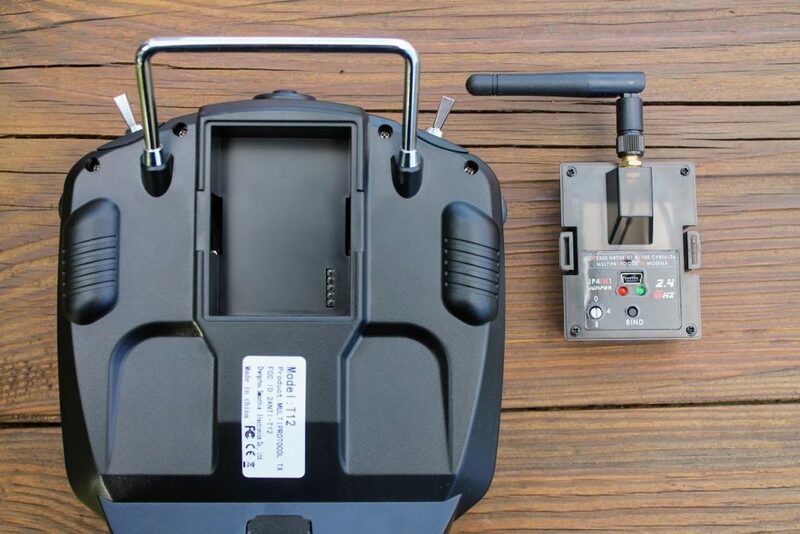 They do help to keep this small transmitter in the hands, but the grips could be a bit bigger. They are just scaled to the size of the transmitter and not to the size of the hand. 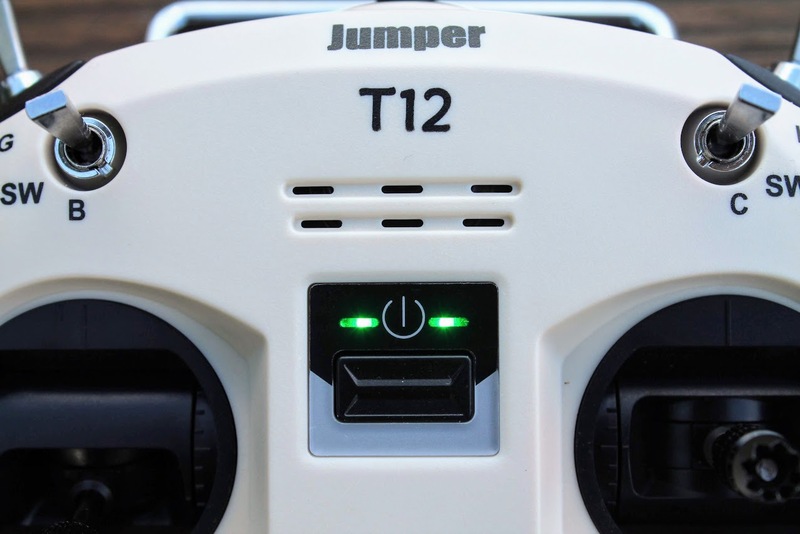 Jumper T12 has external Jumper JP4IN1 multiprotocol module. It is really unknown why the Jumper decided to use external module instead of the built in one as can be found in previous T8SG series models. 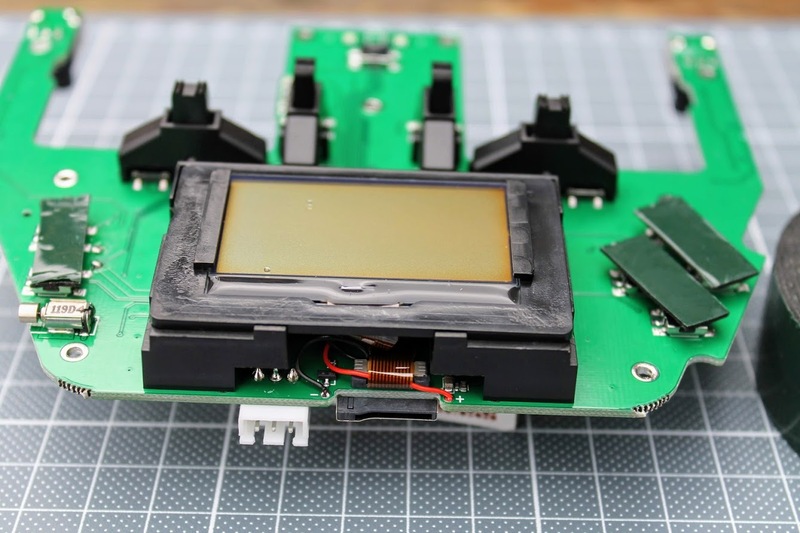 My only guess is to cut the development costs and to reuse already made and verified multiprotocol JP4IN1 module. 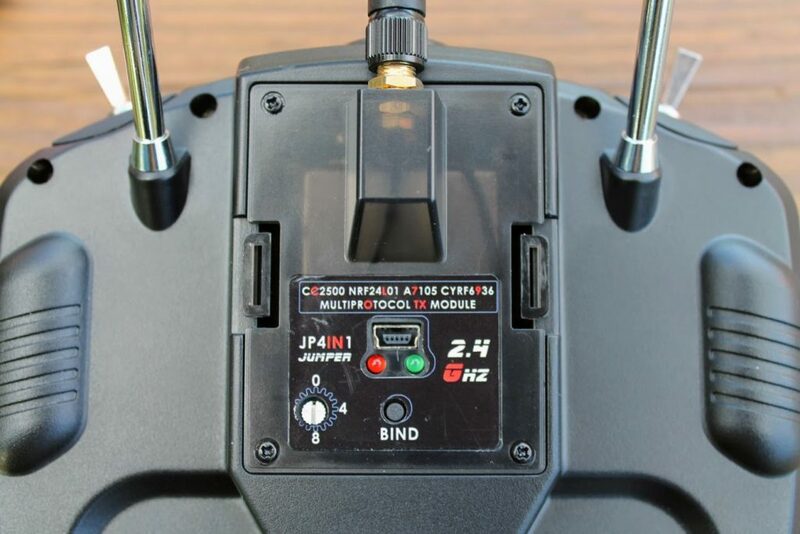 Multiprotocol module can be easily removed and you can use FrSky R9 or TBS Crossfire long range system modules in this JR type module bay. 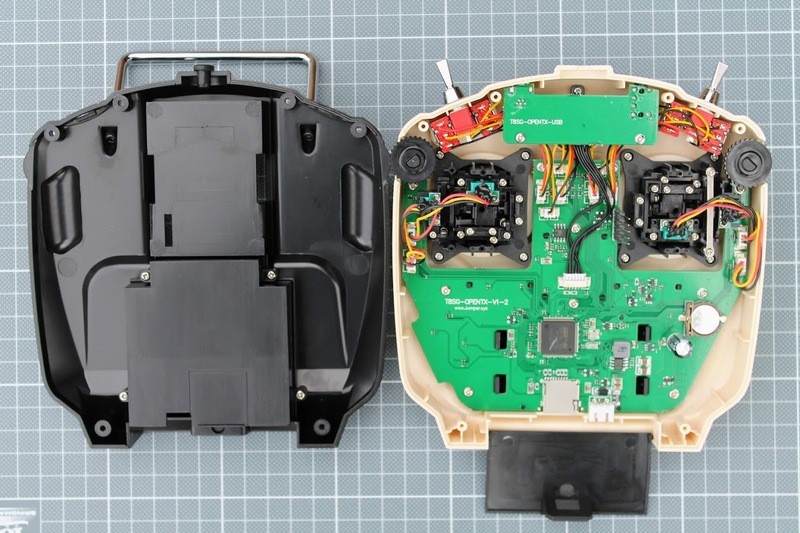 There is a hatch door on the bottom of the transmitter for battery and SD card. Jumper T12 comes with 3 AA battery holder, but I advise to use 2S Li-Po or Li-FePo battery for powering this radio. 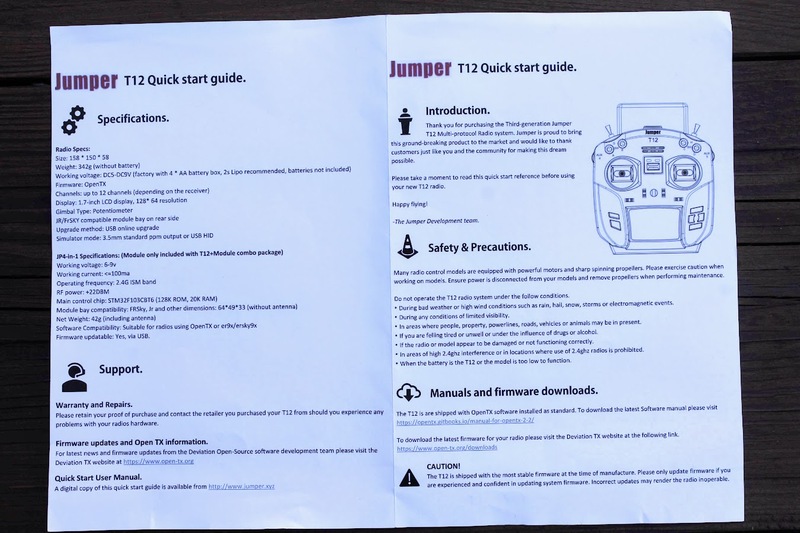 The problem with JumperTX is that developers refused to add the support for Jumper T12 radio in the main OpenTX code. 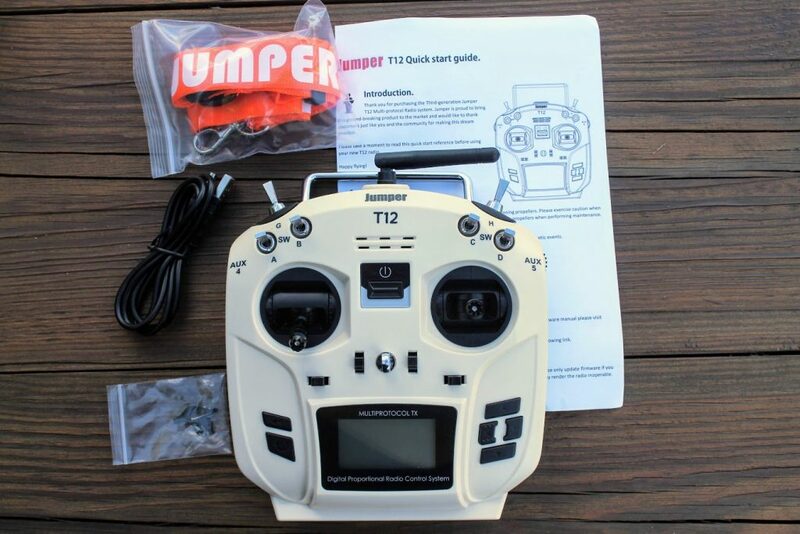 That means all the future updates must be manually customized to fit the Jumper T12 radio. Will the Jumper release the updated versions of the JumperTX firmware is unknown. Time will show. Gimbals are all plastic construction. Axis shaft is sitted on the two ball bearings, so the stick movements are quite smooth and precise. 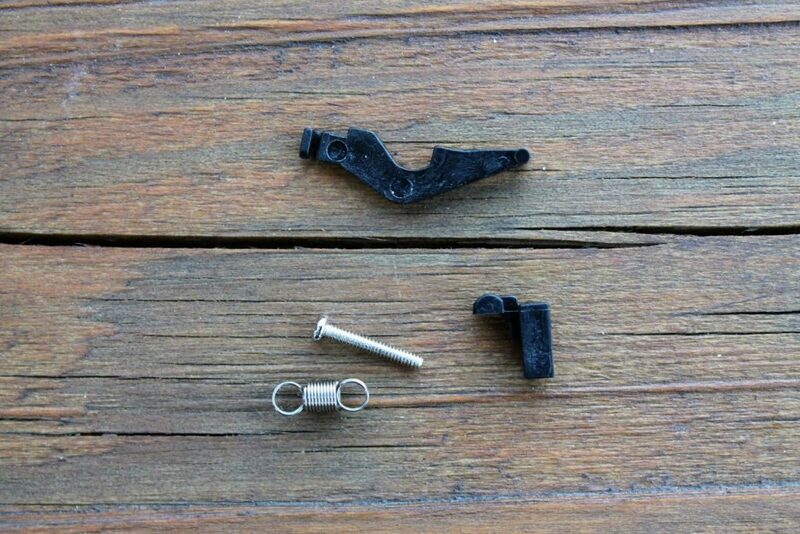 The gimmbal sticks are quite short, but can be extended 4 mm more. 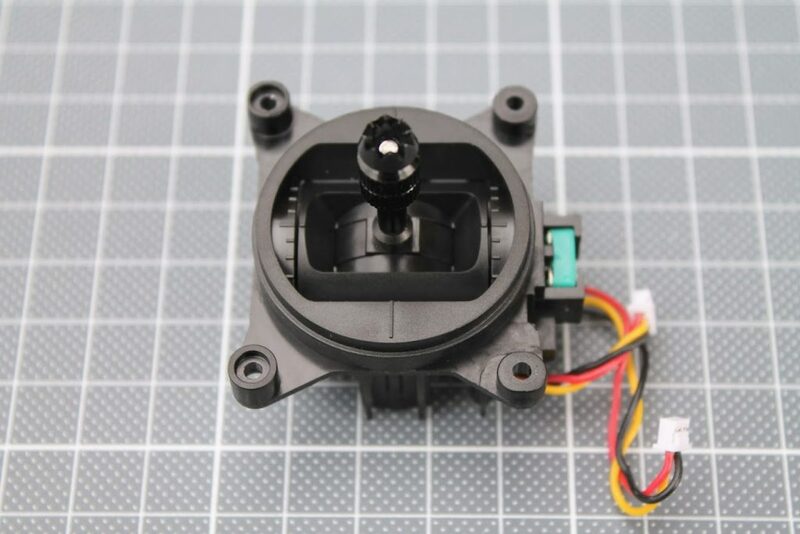 The stock gimbal stick springs tensions are too weak for my liking. 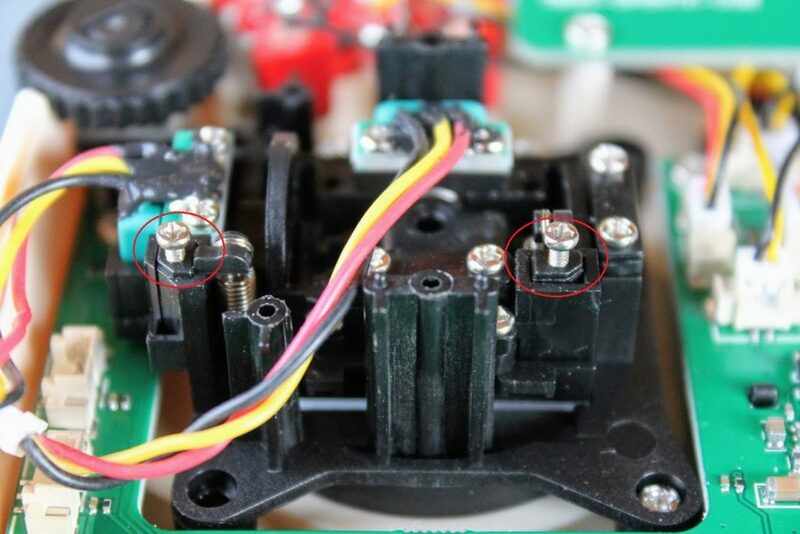 But they can be easily adjusted by turning the spring screw for each of the two axis. Turn clockwise for increasing the tension and counterclockwise to loosen the spring. 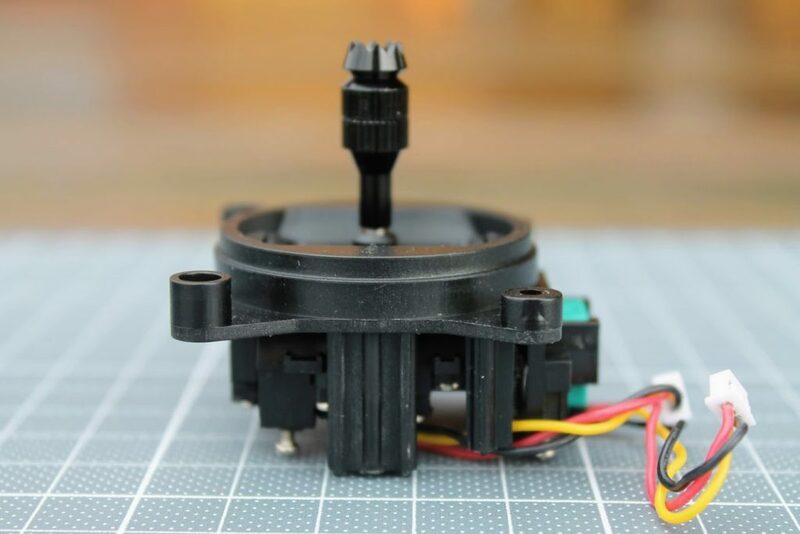 Throttle gimbal has friction tensioner screw and one axis spring adjuster screw. There is no ratcheting option for throttle. 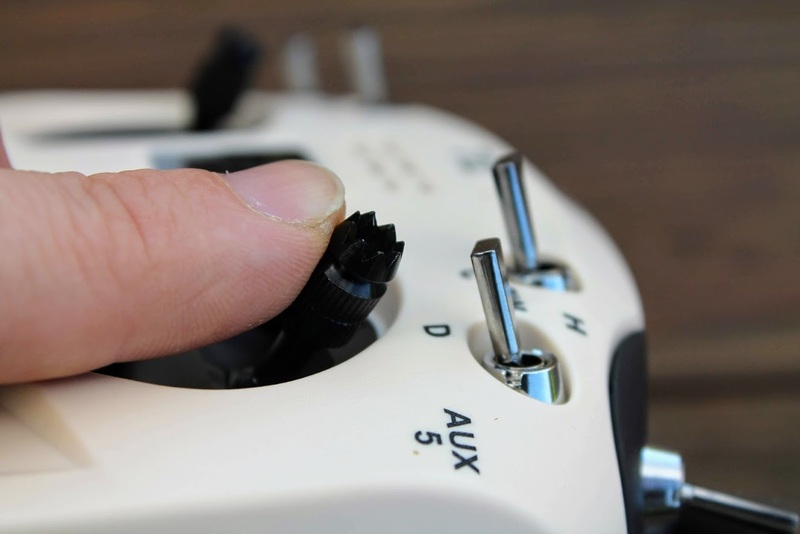 Most of the multirotor pilots dont use throttle with ratcheting anyway. Tested gimbal centering accuracy. They have only about 1% deflection when releasing them gently to return to the center. See A1 and A3 values. If you release them quickly, springs center the stick really accurately. 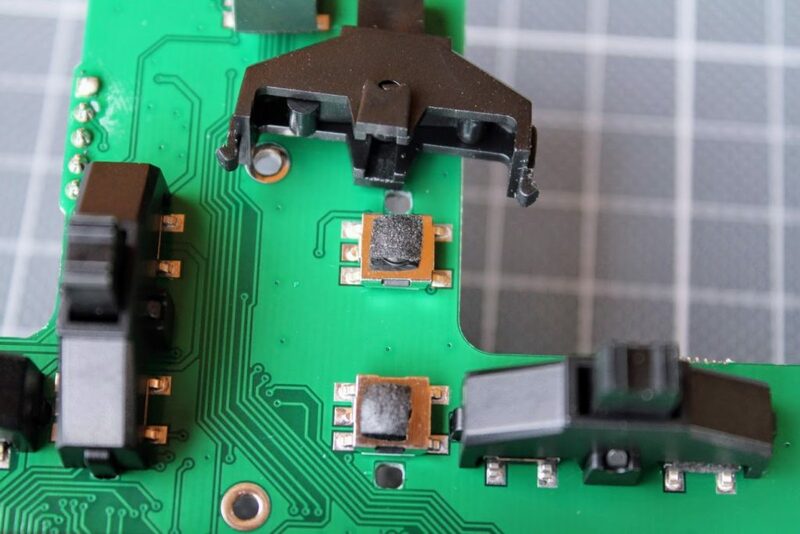 Radio transmitter can be easily dissasembled by unscrewing 6 screws. There is nothing holding or attached to the back side of the case. Inside you’ll find two PCB boards. 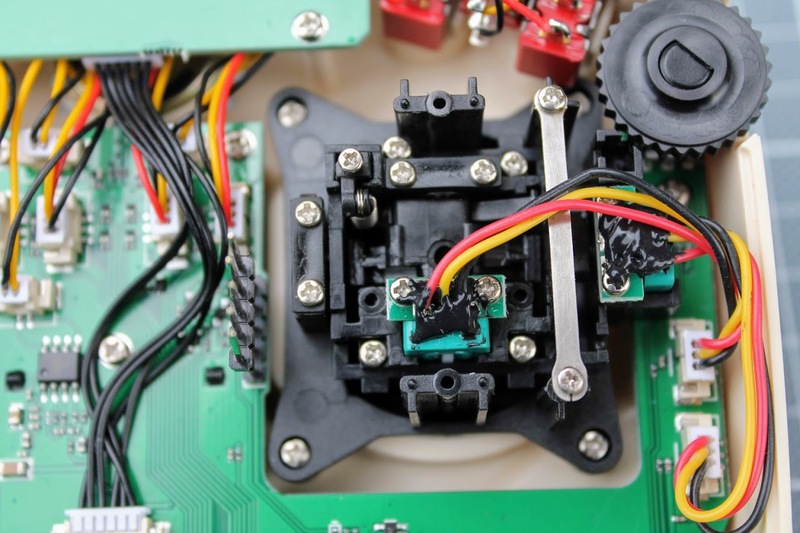 Gimbals, switches, pots – everything is connected with connectors so it is really easy to remove replace the components. 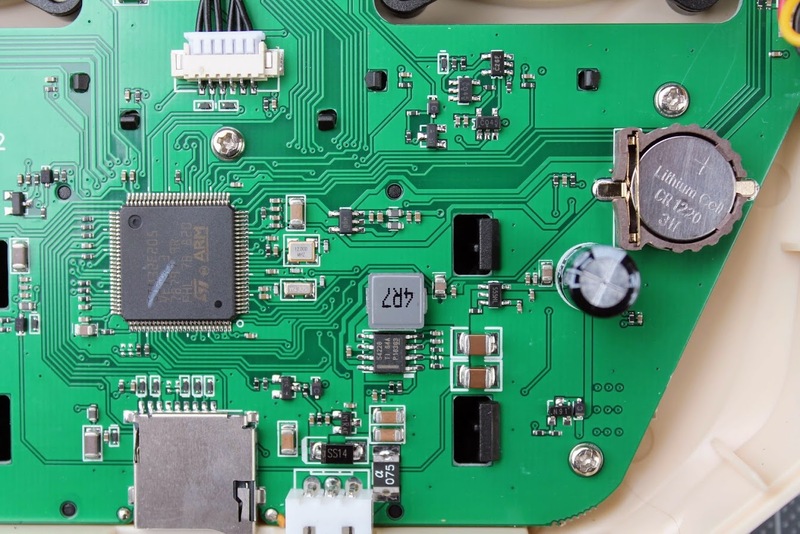 The heart of the radio is STM32F205VET6 (512kb) ARM MCU. Upper board for USB and 3.5mm sockets. Issue: Radio menu navigation buttons, trim buttons and trimm pot dials are rattling like a baby rattle when you shake the radio. This is annoying and adds the impresion of the cheap device. Here is my solution for this issue. You will have to open the radio, disconnect all the wires from the sockets, unscrew the gimbals and remove them, then unscrew the main PCB and remove it also. 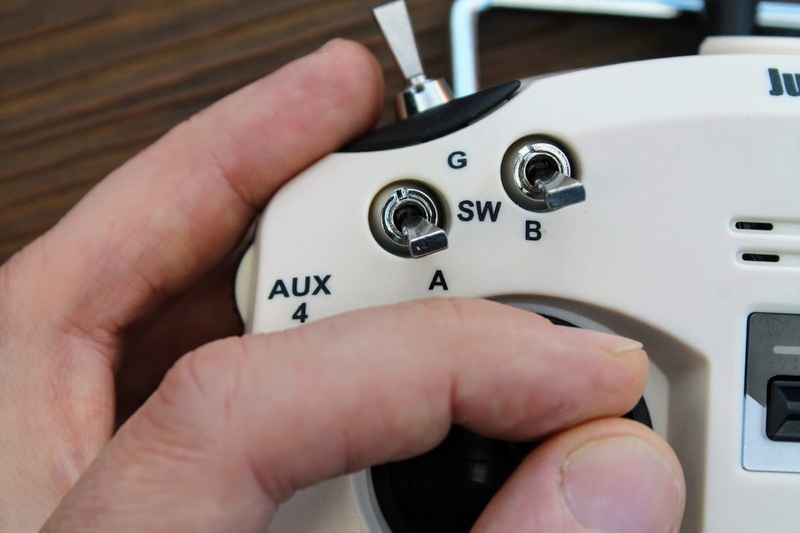 There are four groups of the push buttons: Power button on the upper side, then four trimm buttons for the four axis, select and cancel buttons on the left and naivigation buttons on the right. 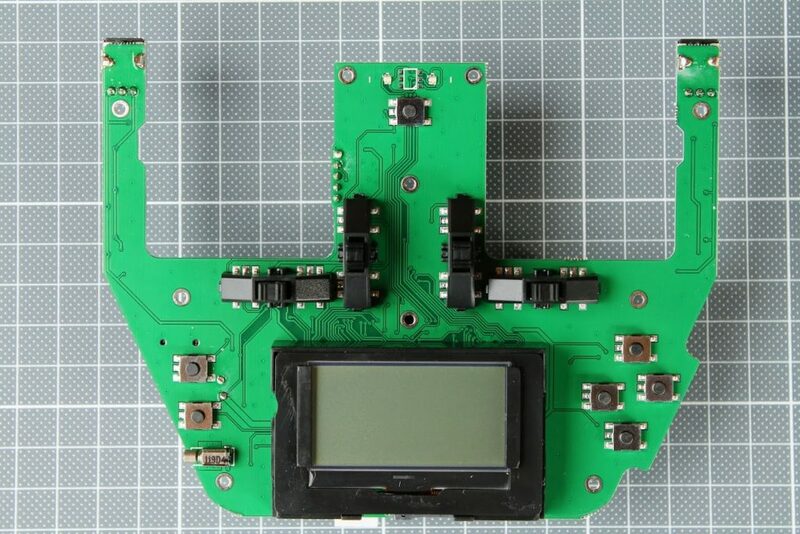 Take a thin (about 1-0.5mm thickness) double sided tape, cut some pieces and and stick them to the selection and navigation buttons. 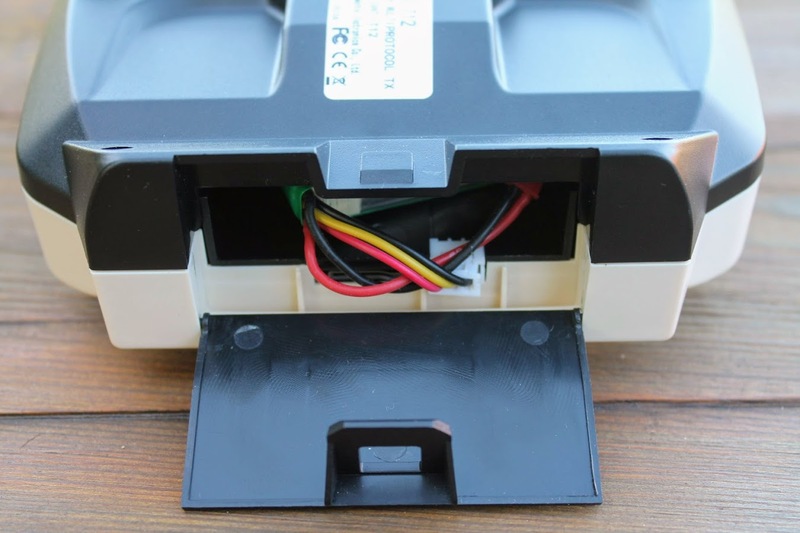 Carefully mount off the trimm buttons cover and apply small piece of double sided tape on the each of the 8 buttons (2 buttons for each axis). 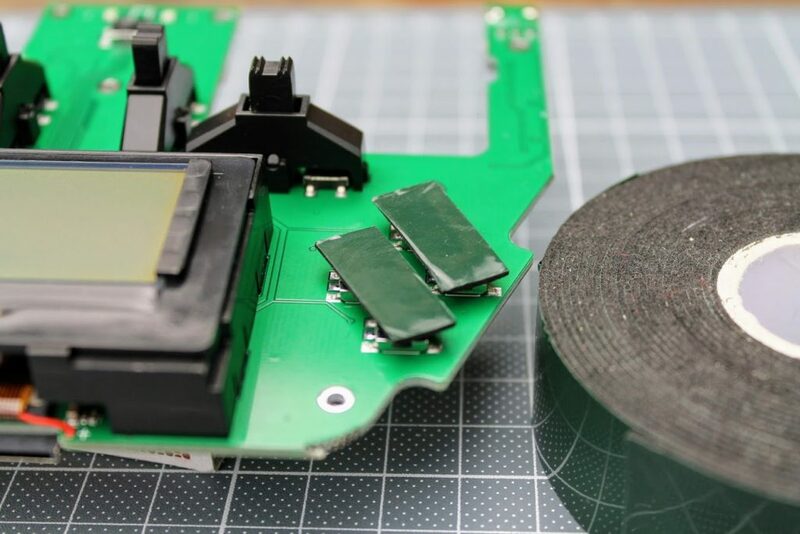 Also don’t forget to apply the double sided sticky tape to the Power button. To fix the rattlingpot dials I have applied a small dab of the superglue on the each of them. 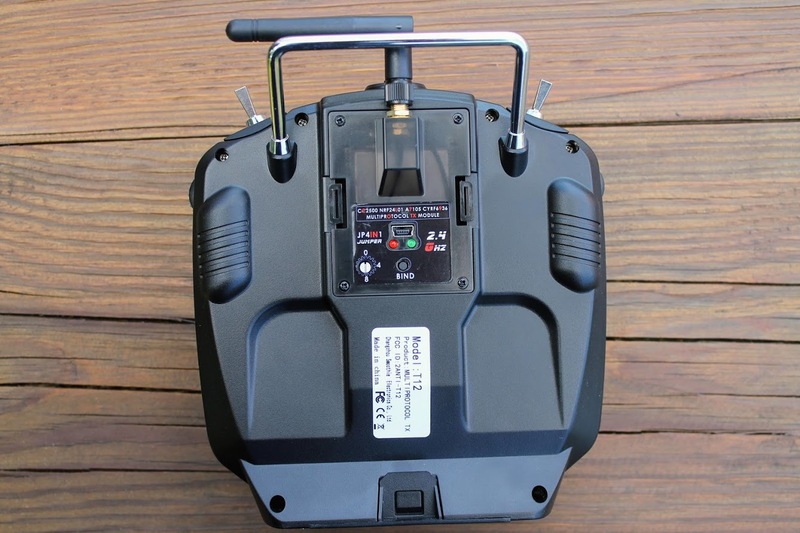 After this mod the feel of the push buttons is softer and the rattle is completely gone! 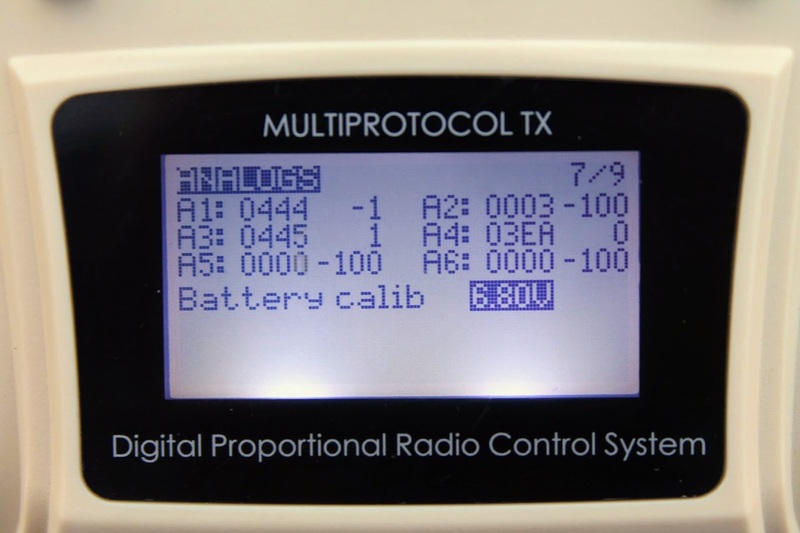 Multiprotocol out of the box! Jumper T12 is the first out of the box multiprotocol radio, running OpenTX based firmware. Unfortunately the developers of the OpenTX have refused to give support to this this radio in the main code, so the Jumper had to fork the source code and make their own customized firmware called JumperTX. The gimbals of the radio transmitter are good enough. There is almost no deadband in the middle of the sticks travel. They center quite precise. 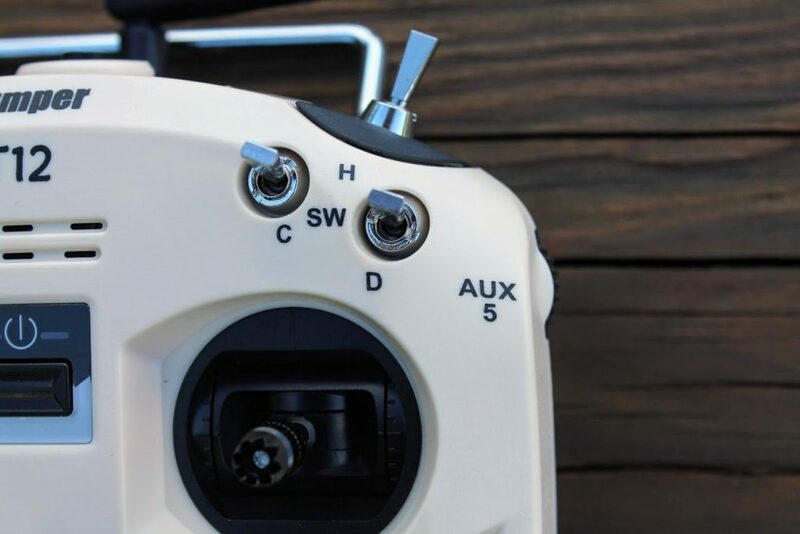 3-way switches are too close to the gimbals and pinchers can have problem accidently pushing the swich from the lower position. 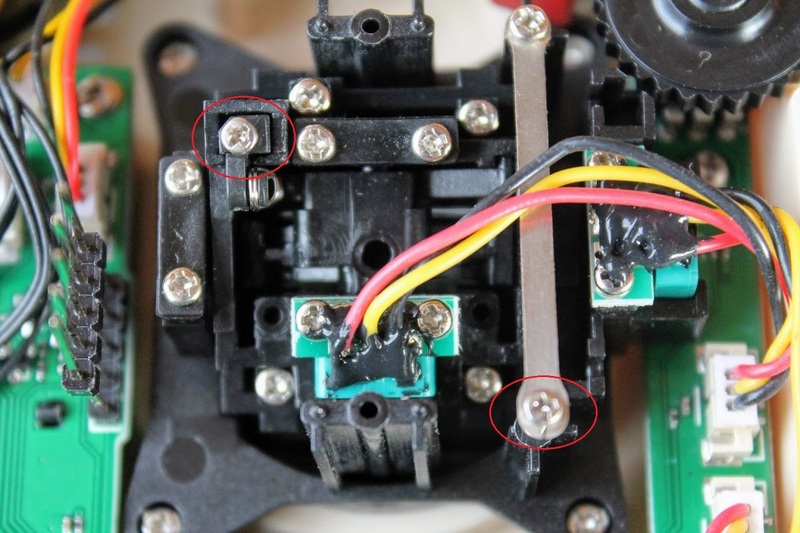 I have solved this issue by not using only the middle-top position of these two switches. 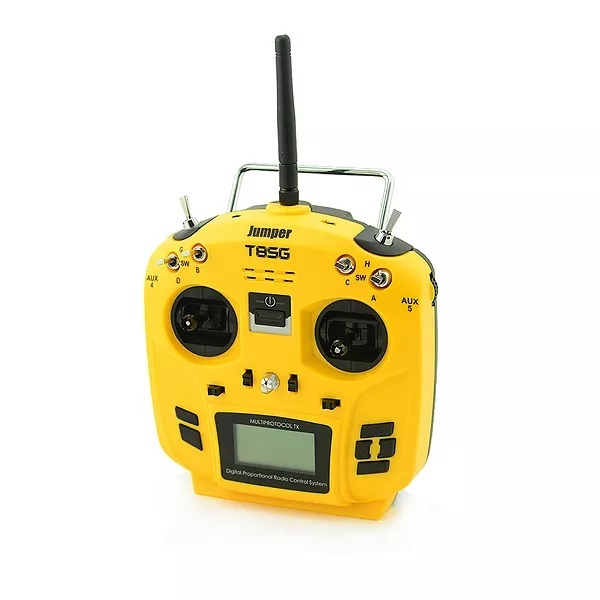 Some of the pilots will find that this radio is slightly too small for their hand, but probably it is just a matter of getting used. I also think thet this radio could be slightly wider, but it is good enough as it is. And it is smaller than other radios and ocupies less space in the backpack. 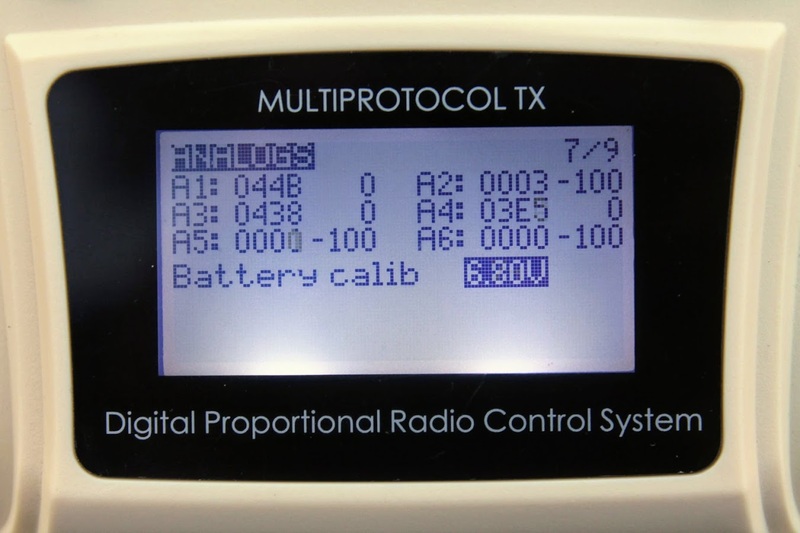 You cannot beat the convenience of the multiprotocol module! One transmitter for all your fleet. 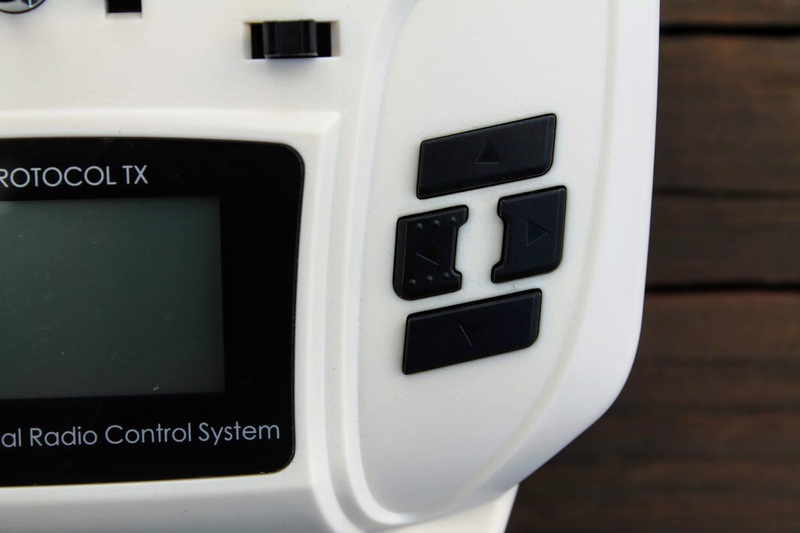 It controls FrSky, Flysky and a number of the toy grade quadcopters that I have. Unbelievably convienient! 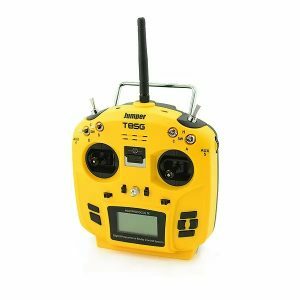 This radio can be really recommended for beginners and intermediate pilots, especially if you have aircrafts with different protocols. Disclaimer: This item was supplied by Banggood for a fair and unbiased review. 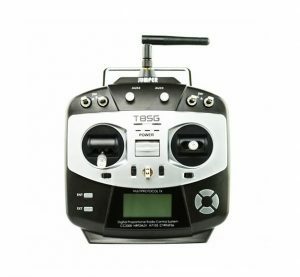 Banggood never asked for a positive review and never infuenced my opinion in any way. I’m trying my best to stay uninfluenced and give only my own opinion. All affiliate links, if there are any, will help me purchase products for independent reviews.